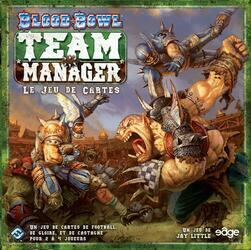 Blood Bowl: Team Manager, The Card Game is a complete game for 2 to 4 managers, which will keep them in suspense for a whole season of Blood Bowl. Personalize your team by enlisting Stars, hiring coaches, upgrading facilities, and cheating like crazy. Lead your group of broken arms and miscreants to glory by crushing your opponents to become Spike's Manager of the Year! Magazine. May the season begin. And crack the Azes! Your hour of glory has arrived!